For years I've been on the hunt for something bigger than myself. Seeking fulfillment from people, my career or material items.. and so many of these "things" have ended up disappointing me or leaving me with a feeling of emptiness. Throughout 2016, I did a lot of soul-searching, trying to figure out what my next move would be. I spent a lot of time writing down periods of my life I felt like I was my best self.. What was I doing? Who was I with? What was I eating? Was I active? And most of the moments I could think of all came back to travel and community. I truly believe a person is a product of who they surround themselves with.. the type of community they're involved in. So, when I thought about the person I strive to be or the type of community I want to be apart of I knew I needed to make a drastic change. I remember the moment like it was yesterday. I was sitting in Puerto Rico, sunbathing and I happened to see a Facebook ad for Remote Year. I had heard of the program in the past but never thought it was a good time to consider such a big move. Within 5 minutes I had researched other programs and found We Roam. It didn't take long to realize this program would be a good fit for me. Pretty sure I applied right then and there and within 3 weeks had been accepted as a future Roamer. It's amazing that was more than 9 months ago. 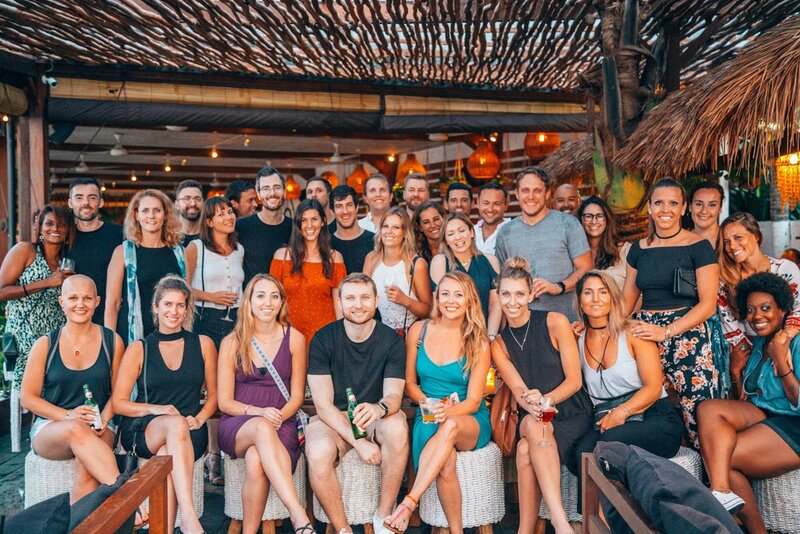 Never did I think the day would come I'd be sitting in my own individual apartment in the middle of Canggu, Bali, working with 30+ unique individuals from not only around the US but around the globe. Saturday will be a full week since arriving at the guesthouse, greeted by 5 glowing girls (they claim it was just the sweat .. but I think differently.) I've had a chance to meet everyone in the group and I can't express how excited I am to grow my relationship with each and every one of them. The crew is exceptional. There's an energy I haven't experienced before and I can only imagine it's going to get better and better as the months go on and we spend more time with each other. Canada, South Africa, UK, Chicago, Nashville, Charlotte, Austin, NYC are just a few of the awesome places this crew is from. Collectively, we all have very different career paths and experiences. Anyone in need of a Education Lobbyist? Software engineer? Art Director? Fitness Enthusiast? Travel Blogger? You name it, we've got it. We're an eclectic crew with a whole lot to offer this world and each other. My hope is to walk away from this experience with friendships that will last a lifetime. I've been told past Roamers form businesses together, have reunions all around the world, go to each others weddings.. I'm sure the list is endless. We're all in this together, experiencing every high and ever low. We eat together, work together, adventure together. It's a once in a lifetime opportunity (for me, maybe not the others) and I'm so happy this is the crew I'll be Roaming along with for the next six months.